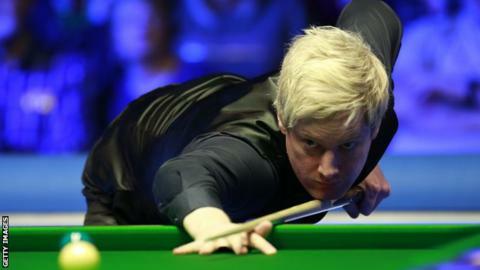 Neil Robertson will face Ronnie O'Sullivan in the Tour Championship final after sweeping past Northern Ireland's Mark Allen 10-6 in Llandudno. His meeting with O'Sullivan is a repeat of the pair's Players Championship final earlier this month, which O'Sullivan won 10-4. "I'm really excited to play Ronnie in a best-of-25, that doesn't happen too often apart from the World Championships," Robertson told ITV4. "It's a fantastic test to see where I'm at going into Sheffield because the last final we played it didn't matter who was the opponent, you can't play any better than that. Hopefully, he drops down from that level and gives me a few more chances." O'Sullivan can supplant Mark Selby at the top of the world rankings if he lifts the trophy. Robertson could have been detained longer on his way to their showdown, but Allen missed a great chance to change the match's momentum in the 16th and final frame.